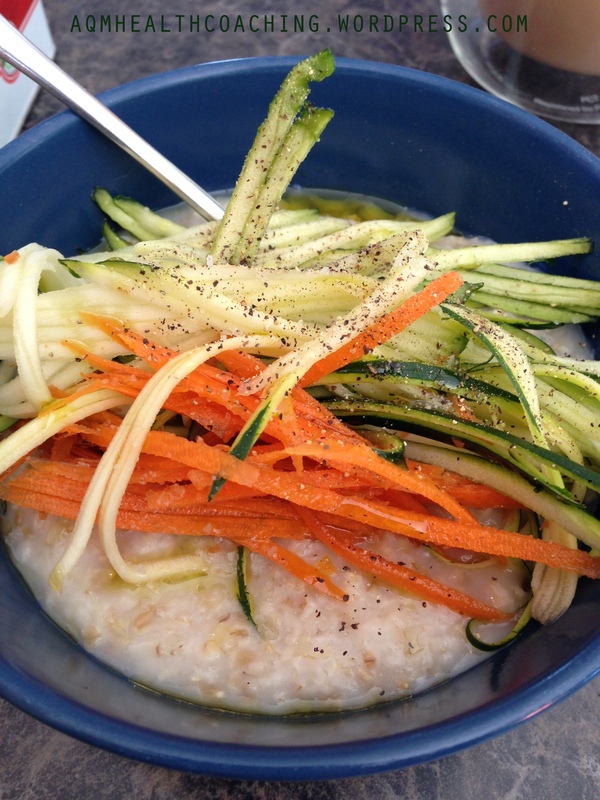 Savory steel cut oats are a great way to clear out the excess from the holidays. Hope those of you who celebrate Christmas had a great day yesterday! With so much yummy food around, I’m sure most of us over indulged a little! My cure for a heavy day of eating is to start the next day with a healthy breakfast so your tip for Day 26 of 31 Days of Healthy Ways to Enjoy the Holidays More is to have a healthy breakfast! One of my favorite breakfasts is steel cut oats. Steel cut oats are high in insoluble fiber, which keeps your digestive system moving and they also have quite a bit of soluble fiber, which will keep you full all morning long (so you’re less likely to reach for leftover sugar cookies or pie). I know most folks eat their oats either plain or with fruit and some sort of sweetener (maple syrup, honey etc) but I’m not a huge fan of sweets in the morning. I’ll eat them that way occasionally but one of my favorite ways to prepare them is with some thinly cut zucchini and carrots, a drizzle of extra virgin olive oil and a sprinkle of sea salt. I know it sounds weird but it’s so good! Steel cut oats take a while to make so I like to make a big batch at night and then reheat in the morning. You can put portions in individual containers and bring them to work (but hopefully you’re off today!). Bring water to boil in a medium sized sauce pan, stir in oats. Let the oats return to a boil, then reduce heat to medium low. Let oats cook, stirring every so often so that they don’t stick to the pan. After 15 – 20 minutes of cooking time, toss in your carrot and zucchini if you want them cooked (you can also top the oats with the vegetables, raw). Let oats cook for another 10 minutes or until it reaches the desired consistency, again stirring to prevent sticking. Turn off heat and serve. Top each portion with the vegetables if you didn’t cook them, a drizzle of olive oil, a sprinkle of sea salt and lots of freshly ground black pepper. Yum! Optional: If you eat dairy, try this with a shaving of fresh parmesan reggiano cheese. It’s also delicious with a fried egg on top. This entry was posted in Dairy Free, Gluten Free, Healthy Tips, Recipes and tagged 31 Days, Healthy Holiday Tips, Olive oil, Steel-cut oats on December 26, 2013 by Andrea Quigley Maynard.